Filed to: Trickle-Down Hybridnomics!Filed to: Trickle-Down Hybridnomics! BMW says its new Euro Mini D diesel will see the high side of 72.4 mpg, by way of its efficient oil burner paired with hybrid-like technologies. Those include brake-regeneration, which uses an intelligent alternator controller that detaches the generator draw from the engine on acceleration and uses engine spool-down on deceleration to recharge the battery. It also includes (on manual-transmission cars) a stop-start function that kills and restarts the engine rather than idle in neutral. No word on the company's plans for exporting the system, but we'd imagine it's inevitable in the era of $4.00 gas. Screw you, piper. We won't pay! 72.4 mpg. 104 g/km C02. No batteries required. MINI hatch models are to receive technological revisions later this year, resulting in jaw-dropping performance and efficiency figures. Already BMW Group's cleanest ever car, the MINI Cooper D will be capable of returning an astonishing 72.4mpg, with CO2 emissions of just 104 g/km. When production of the revised models begins in August 2007, there will be no requirement for alternative fuel sources or hybrid technology to achieve these stunning stats. All model variants will instead be supplied as standard with high-tech engine tweaks, providing exceptional economy and minimal emissions without compromising the MINI driving experience. Brake Energy Regeneration, Auto Start-Stop Function and Switch Point Display complete a package that will come at no extra cost to future MINI customers. Brake Energy Regeneration works by using an Intelligent Alternator Control (IAC) and an Absorbent Glass Mat battery to recycle previously lost energy, which saves fuel. The IAC reduces drag on the engine by only engaging when required to charge the battery, whereas a traditional alternator is always pulling power from the engine. Additionally, the energy generated by the engine on over-run (under braking or descending a hill) was previously wasted. Now this lost energy is utilised by the IAC to charge the battery. The Auto Start-Stop Function, available with manual transmission cars, automatically switches the engine off when the vehicle is stationary and the driver puts the car into neutral. To restart the driver only need engage the clutch again before pulling away in the normal manner. The system may be de-activated at the touch of a button when not required. Switch Point Display aids drivers of manual transmission MINIs in selecting the most economical gear in which to drive. The engine management system analyses speed, road situation and accelerator pedal position and based on this data calculates optimum gearing. The ideal gear is then displayed by number in the cockpit display. Even without these technology advancements in place, MINI leads the new car market for year-on-year improvements in clean engine manufacturing. C02 output per car has been reduced in the last year by an impressive 14 per cent. Putting that into perspective, the industry average was recorded at a lowly 0.3 per cent. To put the icing on the cake for customers, MINI Cooper D owners will continue to benefit from the car falling into VED tax band B. So savings are not only made in carbon emissions, but at the fuel pumps and the Post Office when replacing an annual road fund licence too. 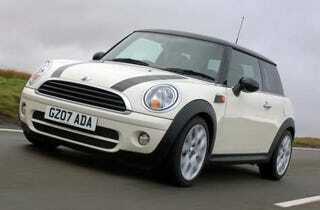 Little wonder then that MINI UK is again celebrating a month of record car sales!